This rescue treatment mask is made out of plant milk and white blossom, I can actually smell and feel that after I squeezed some onto the back of my hands! Big ups for that! Means it’s mild and gentle for your skin, so way to go! YAY! After 15 minutes, my skin has absorbed 90% of it, but it has some residue left on my face though. I can feel the moisture is overloaded which I have to tissue it off. I like it because I want my skin to drink up as much moisture as it can until it can’t anymore, and then I would just tissue off the rest that’s left on my face. So this mask does exactly what I want. I also use this on face and neck together, except the eye area. 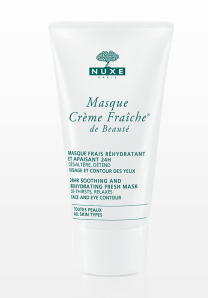 This is a good old milk based mask for anyone whose skin needs a little pick me up! Moisturize, sooth and calming all in one! SK2, Biotherm and Lancome’s sheet masks are quite good but on the pricey side. Please share your thoughts on your favourite mask!